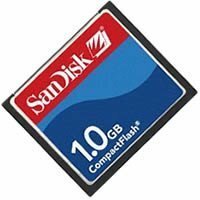 About the size of a matchbook and weighing in at a mere half an ounce, the SanDisk 1G CompactFlash Memory Card has a high storage capacity, and delivers a high transfer rate for fast copy and download. It is a non-volatile storage solution that offers high performance with low power consumption, and resists breakage as they are not affected by extreme heat or cold. Compatible with all digital cameras, handheld PCs, digital audio players, and other devices that feature a CompactFlash slot.